Ferguson Response is so pleased to host #BlackPodcastWeek 2017 – our yearly celebration of Black Podcasts & Podcasters. This third annual week of Black Podcast Love is our way to show our appreciation to all the Black Podcasters who put out amazing content all year long. With a different podcast focus each day, this week allows everyone to get some shine culminating in a Sunday March 26 Twitter Chat at 7:00 PM ET where Black Podcasters will discuss their work & the good, bad & ugly parts to podcasting while Black. 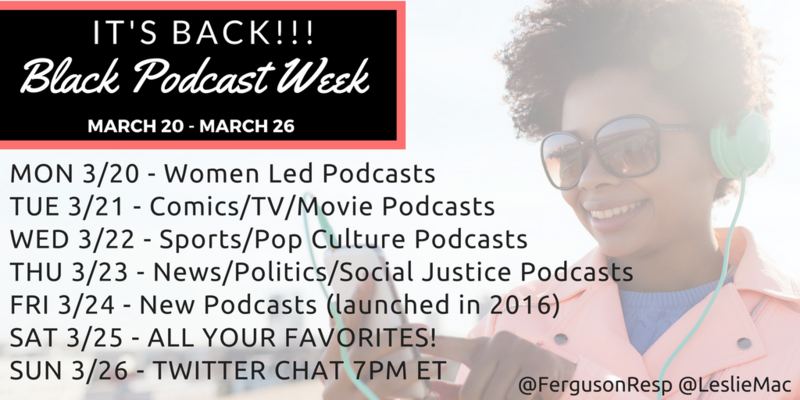 Follow @FergusonResp & @LeslieMac on Twitter to stay informed about #BlackPodcastWeek! Ferguson Response is so excited to announce the details for our 2nd annual #BlackPodcastWeek! Started last year as a way to highlight & give some shine to as many amazing Black Podcasters as possible, this year we hope to expand the reach and get more people listening to Black Podcasts. This year the fun begins Monday March 28 and runs through Friday April 1st. Co-hosted by Americans United Again – this week long celebration of Black Podcasting is for EVERYONE. 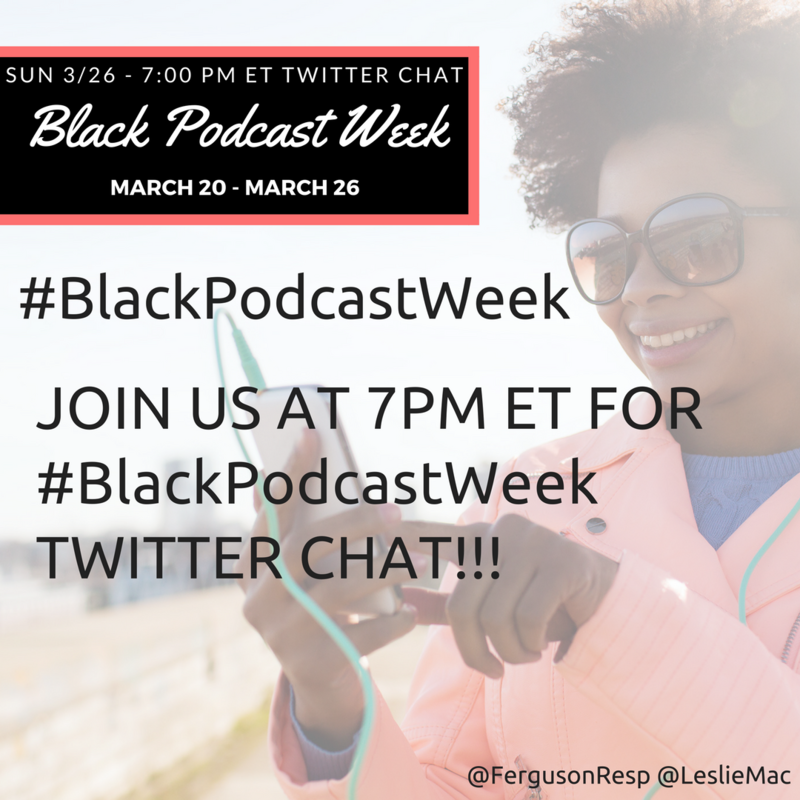 Be sure to use #BlackPodcastWeek for all of your tweets & posts! 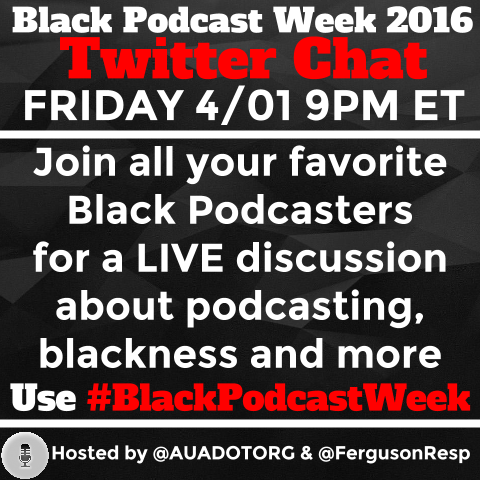 We have added some additional categories and most exciting of all a LIVE Twitter Chat on Friday April 1st 9PM ET where your favorite Black Podcasters will be discussing podcasting, blackness and more! @LeslieMac & Ricky from @AUADOTORG are joined by Mikki Kendall, Roni Dean-Burren, Edith Campbell & Allyson Criner Brown to discuss #ReclaimMLK 2016 and the current, historical and on-going saga of the #SlaveryWithASmile narrative in children’s literature. UPDATE 1/25: We successfully delivered over 1,000 gallons of water to Flint on Sunday 1/24. We also made direct contact with an amazing (Black Female) local organizer who we will be supporting and working with moving forward. In addition to the water deliver, we were able to work with local organizers to translate their specific demands, pay for copies of the demands to be distributed locally and provide financial support for the local organizer. Please continue to donate & share the link so we can help this amazing woman do what is needed to make real change for her community in Flint. 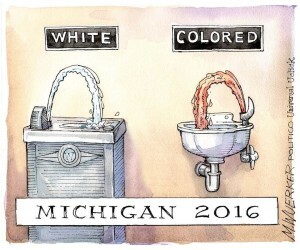 T he Flint Water Crisis has left those most in need of help with little support. Current mechanisms have left Public Housing & jail/prison inmates out of the donation cycle. Ferguson Response is headed to Flint with members of BLM-Kalamazoo and needs help renting a truck & securing water for folks in need. Our efforts will solely focus on deliver to Public Housing in Flint and in gaining access to inmates to give them clean water. Inmates in Flint are STILL 100% on contaminated water with no filters – they are forgotten and this needs to change. Please donate today. #MLKNOW – Celebrating the Words and Legacy of Dr. Martin Luther King Jr. I woke up this monday morning feeling so blessed and privileged to have been present in body and mind at the historic #MLKNow event. My soul was touched deeper than ever before as i connected with powerful radical words that resonated from our past, delivered by new voices heard as fresh as when first spoken. 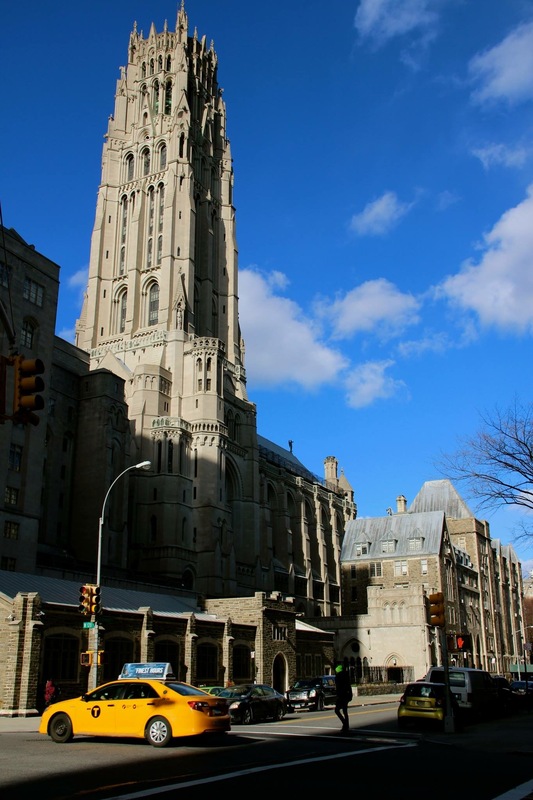 The Riverside Church in Harlem is a true spiritual place, it’s a building that on entering you can feel without touching. It was here in this space that Dr. Martin Luther King Jr gave his speech “Beyond Vietnam: A Time To Break Silence.” – A speech that most agree guaranteed his ‘murder’ warrant \ MLK looked over the mountain and beyond the walls of the US and connected US State oppression to other lands, and outlined a plan for economic divestment that offered a strategy to limit the powers of corporate America in more ways than the bus boycott previously had. Riverside has a strong activist history and provides a safe space where the Black radical voice can speak freely, in a way that almost seems protected by its looming walls that saw the moral titans of past and present prophetic resistance. Animated by its long tradition of community, it is a space so strong in its identity and proud of its heritage that 60 years later the beneficiaries of MLK’s legacy could safely regroup and reclaim the message in the tone that MLK had intended. @LeslieMac & Ricky from @AUADOTORG are joined by Mikki Kendall, Roni Dean-Burren,Edith Campbell & Allyson Criner Brown to discuss #ReclaimMLK 2016 and the current, historical and on-going saga of the #SlaveryWithASmile narrative in children’s literature. Since this post was published Scholastic released a statement pulling “A Birthday Cake for George Washington” from shelves. Debbie Reese curated this page which includes a running list of posts & articles related to this book and the fall out. Last year we saw the book A Fine Dessert released to large acclaim. This children’s book about a dessert – Blackberry Fool – as made by 4 different families in 4 different eras includes a slave woman & her daughter making the dessert for the slave owner. You can read a few pieces about this critically acclaimed piece of children’s literature here & here & the author’s response to criticism of her portrayal of #SlaveryWithASmile here. Now in 2016 we have another entry in the #SlaveryWithASmile genre with Scholastic’s new book “A Birthday Cake for George Washington”. This books release was accompanied with a pre-emptive explanation of the language & imagery used to tell the story of one of George Washington’s slave cook Hercules. You can read that piece written by Black editor Andrea Davis Pinkney here. Book Critic Edi Campbell give a critical dissection of the book. Educator Roni Dean Burren made several videos on the topic here & here and a post in response to the author here. The author Ramin Ganeshram wrote this response to all the criticisms of the #SlaveryWithASmile depicted in her book. 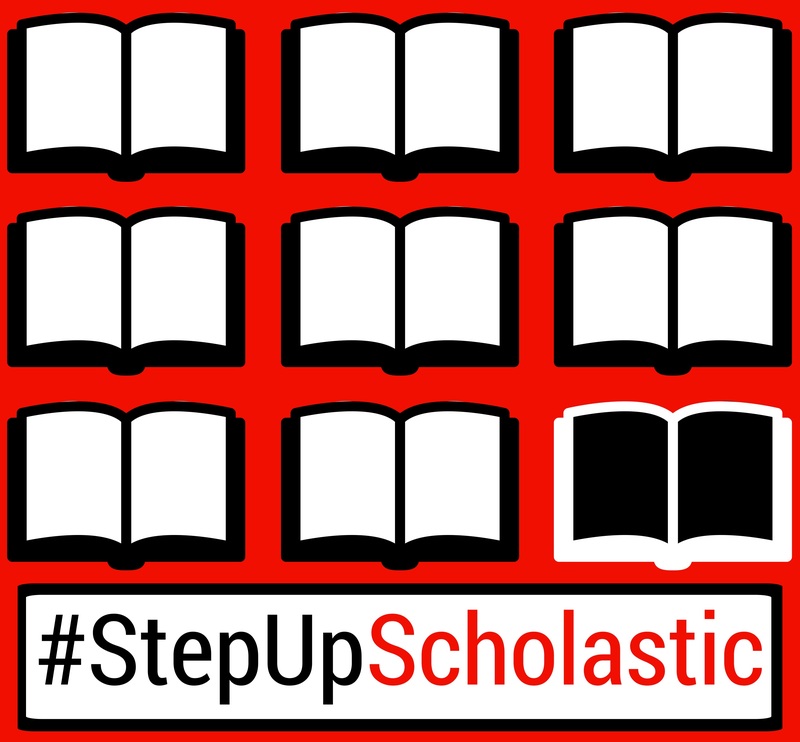 There is also a petition from Atena Danner to Tell Scholastic Stop Promoting Racist “Happy Slave” Book to Children. A week from today I will be sitting down for an in depth discussion about #SlaveryWithASmile on Ferguson Response Podcast. I will be joined by some amazing women Roni Dean Burren, Edi Campell & Mikki Kendall. I look forward to this enlightening & honest conversation about how our past as Black people us portrayed in literature. NOTE: I have reached out & invited both the author & editor of A Birthday Cake for George Washington to join us – neither have responded to the invitation. We are pleased to share this piece from Julian Long originally posted via Facebook. Click here to FOLLOW (not Friend) Julian on Facebook. I do not much care for Blaxplaining the way the world works. I get emotionally exhausted trying to answer “why” questions that have no answer just to show empathy with you showing empathy with me. Blaxplaining makes my intestines itch. I point out obvious things. Signs in the sky that indicate changing weather. But I don’t often explain why the weather has changed. I’m making an exception today, because there’s a darkening in the skies and, in the present context of 150 white men overtaking a federal building, I’m going to try and Blaxplain how this unrest sits with us with hope that some of you, who often read my words but don’t comment, don’t share and don’t “like” them (literally or figuratively) can explain to me what you think comes next. In August of 2014, in a small suburb of St. Louis called ‪#‎Ferguson‬ , our nation sent The National Guard along with militarized police to squelch the protests of a few scores (that later grew to be hundreds) of citizens who were appalled at the grizzly murder of ‪#‎MikeBrown‬. These protesters were largely Black, unarmed civilians. There was some property damage. The media continually called it rioting. Dozens were arrested. Beaten. Pepper Sprayed. Shot with rubber bullets. Some months later we pointed out how in a town in ––New Hampshire, I believe –– I dunno, someplace that just sounded really white, large groups of white unarmed civilians overturned cars, burned property, took to the streets over…pumpkins. The media called them revelers. The police were called but they didn’t bring their tanks. It was whitesplained to us that this was different –– because it wasn’t a hot-button issue and likelihood of severe damage or loss of life was minimal. The Ferguson protests went on for DAYS, we were told – THATS why it had to come to the boiling point that it did. We didn’t accept that. But we knew it would become the company line. Drawn in the blood on the pavement. Never to be crossed. There were other images too.